She's not bad…she's just drawn that way. Her husband Roger is one lucky rabbit! 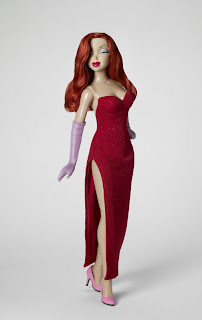 Tonner presents the sultry Jessica Rabbit in this 17" Athletic Body w/ Green Eyes. Disney's most curvaceous heroine ever is making men's hearts throb everywhere! This gorgeous doll comes dressed in her trademark shimmering red dress with daring side slit, knit opera gloves, pantyhose, and faux leather pumps.